Separation and divorce affects every part of a person's life: from finances to physical and emotional health to children and parenting. This issue offers vital articles to help readers cope with the challenges of separation and divorce, and move them from merely surviving to actually thriving. With the change of the seasons comes the time of year most dreaded by newly separated and divorced people: the holiday season. 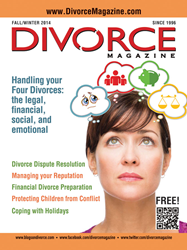 The Fall-Winter 2014 issue of Divorce Magazine is now available for download at http://www.DivorceMagazine.com. With the change of the seasons comes the time of year most dreaded by newly separated and divorced people: the holiday season. Divorce Magazine’s editors recommend that people in transition should make plans well in advance of the major calendar events to avoid falling victim to the "Holiday Blues". Family-centered celebrations such as Thanksgiving, Passover, Hanukkah, Christmas, and New Year’s Eve can underline how much a divorced person’s life has changed – increasing feelings of sadness and loss. In this issue, “Happier Holidays during and after Divorce” offers tips and guidance to help readers create strategies to cope with – and even enjoy – the festivities. Most people think of divorce as a single event: you get divorced, and it’s over. “The truth is there are really four divorces happening all at the same time, and over a period of time,” says author and lawyer M. Marcy Jones. “Everyone goes through each of these divorces differently and over different periods of time.” In the cover story – “The Four Divorces”– Jones discusses the legal, financial, social, and emotional impacts of divorce. Separation and divorce is an emotional time for all parties, and feelings of anger or grief can prompt people to say or do things that would otherwise be completely out of character. Acting in a way that appears irresponsible, inappropriate, or antagonistic can have a negative impact on a case, leaving someone with both less money and less time with their kids. In “Managing your Reputation during Divorce”, author Christine Pesoli offers advice on how to protect or polish a good name. Tips include using social media with extreme caution as well as making conscious choices to be “better and smarter than your anger would have you be,” Pesoli says. Divorce affects every part of a person's life: from finances to physical and emotional health to children and parenting. Every issue offers articles to help readers cope with the challenges of separation and divorce, and move them from merely surviving to actually thriving. Offered in regional editions, Divorce Magazine features advice from local divorce lawyers and other professionals regarding legal, financial, co-parenting, children’s, and practical divorce-related issues, as well as a listing of the best online and professional resources available to divorcing individuals. Published since 1996, Divorce Magazine is North America’s only magazine devoted entirely to divorce-related issues. The magazine is the authoritative voice on separation and divorce, offering expert advice and practical information designed to minimize emotional and financial stress. This comprehensive publication covers all key issues – from child support to custody, mediation to litigation, financial preparation to emotional recovery. Divorce Magazine is published by Divorce Marketing Group – the only one-stop marketing agency dedicated to helping family lawyers and other divorce professionals grow their practices. Divorce Marketing Group offers a full range of marketing services, including: website design and promotion, online reputation management, social media marketing, video and podcast marketing, and print and online advertising. Their other products include Family Lawyer Magazine and http://www.FamilyLawyerMagazine.com, ten print and web-based Divorce Guides, and monthly eNewsletters.